To create an effortlessly elegant home combining the timeless elements of the past with the comforts of a contemporary house seems somewhat of impossibility within the confinements of urban apartments. The smallness of size is off putting enough. Yet, in our heart of hearts we still pine for such abodes of peace and relaxation that is graceful and ageless. It is also true that to create a charming interior you hardly need its elements in grand proportions. Simple arrangement of tasteful furniture, a few nice decorative objects and a soothing colour scheme often create such powerful impact that all the gilds and glitters of a luxurious setting fail to match. But such delicate simplicity is not at all an easy thing to obtain. The owners of this apartment were striving hard to get that unique feel in the interior of their home. 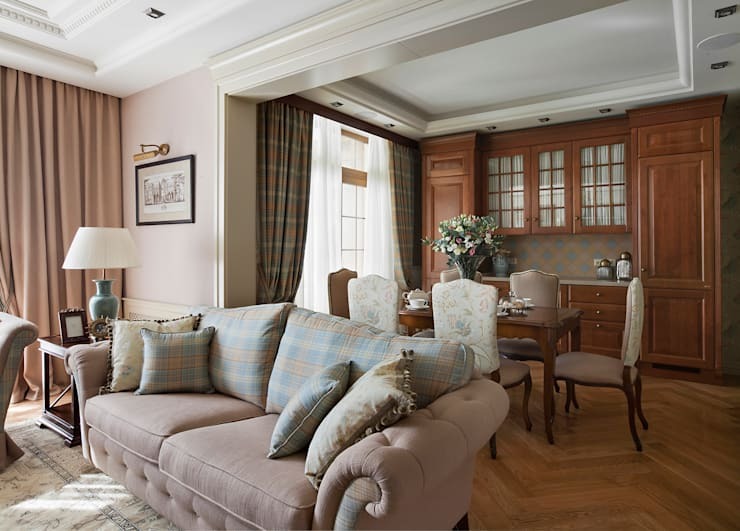 In came VV Design, spearheaded by Barbara Shabelnikova, and helped them achieve that perfect balance between timeless grace, comfort and gentility. The results are here for you to see. The first glimpse of the apartment will tell you, that the inhabitants and designer of this home love to breathe in an opulent atmosphere but not in an ostentatious manner. Predominance of subtle tones like pale brown, even paler blue, lilac and neutral white gives a soothing effect to the ambience. The wooden elements including parquet floor, stylish doors and furniture enhance that genuine feeling of warmth. Sofas and cushions are cosy and simple. The area rug is suitably understated and careful not to overwhelm this small open style lounge also accommodating a dining space and kitchen. Lighting fixtures, including the chandelier hanging from the ceiling, feel equally charming. Large windows help injecting day light in the area. Though decorated with traditional wooden cabinets the kitchen is modern even if built in a slightly smaller scale. A chequered pattern, also prominent in the living room furnishings, appears as tiles behind the worktop and curtains. Curvaceous dining table and chair remind grandeur of a bygone era. But these are lightweight and customised to occupy a small space. A bouquet of flowers brightens up the whole space even further. 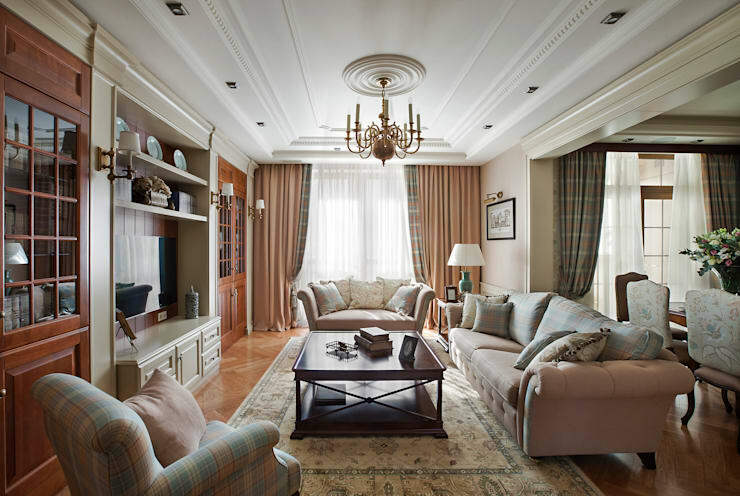 So far, excluding the area rug, we have seen a dominant use of chequered motifs. The wallpapers in the dining parlour reveal another aspect of this urban abode. The floral motifs in subdued tones soften the atmosphere and offsets a relatively meagre use of decorative elements mainly due to lack of space. The dining chairs are also upholstered to match the wallpaper pattern. A walk through the corridor reveals how the rooms are placed on both sides of it. 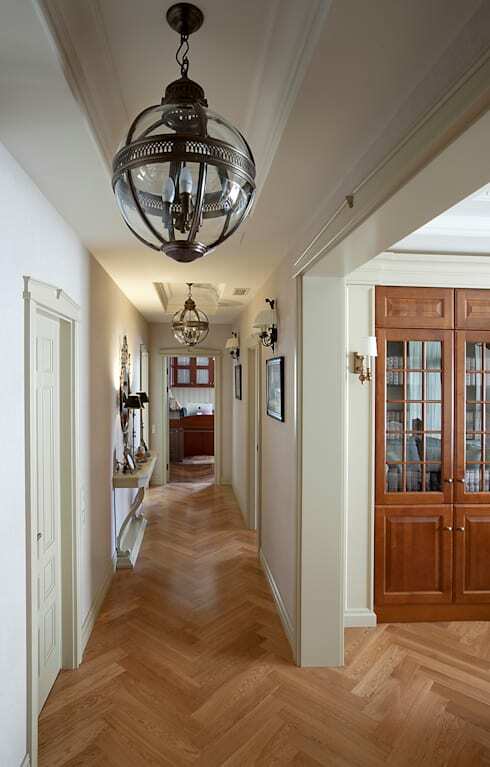 Corridor has the same parquet flooring as the lounge area. It is further embellished with gorgeous pendant lighting. And this is not all. Walk up a bit to stand in front of that chic console table with classically styled mirror gracing the wall above it. Couple of table lamps placed in front of the mirror create a charming effect. 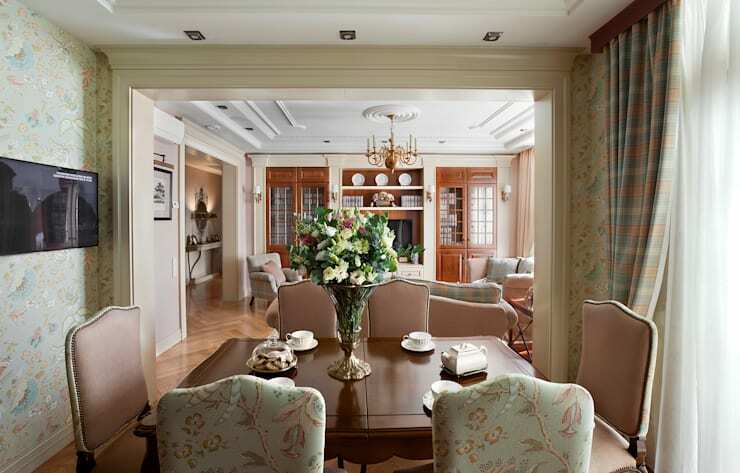 If you are fond of such elaborate features you will also love peeping inside this lavishly decorated apartment. This soothing lavender toned master bedroom with its elegant lighting fixtures, florid wall paper, meticulously framed illustrations and stylish wardrobes seems the perfect place to be after a rough day’s tête–à–tête with the world outside. Of course, the comfortable bed upholstered in lavender toned fabric and supplied with cosy cushions holds the central position in this room. The curtains also match the lavender shade of the bed and wallpaper. Altogether they do not fail to exude an alluringly fragrant charm. In essence the gracefully designed dressing table and arm chair evoke the subtleties of antique La Rochelle. With a finely framed rectangular mirror, a few flowers and a sculptural piece, the designer managed to create a poignant image of one of the corners of the master bedroom. Being closer to the window it enjoys a fine view of the outside and generosity of natural light as well. A secondary bedroom possesses same calm look and even calmer colour palette. 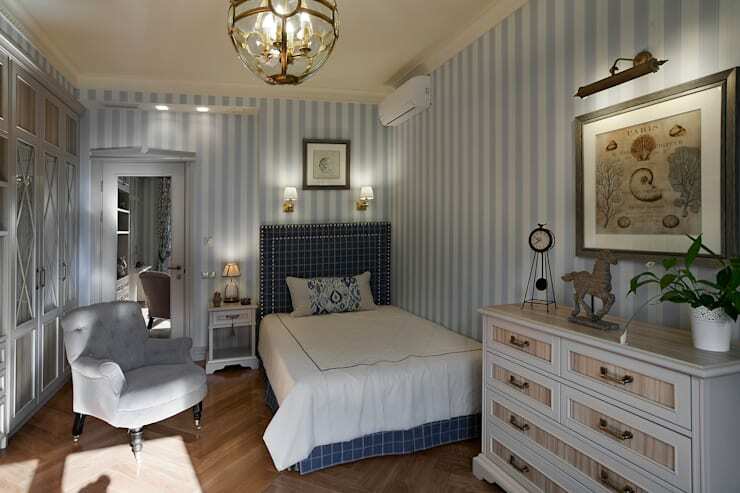 The pale blue stripes of the wall are matched by doors and windows as well as the cosily upholstered periwinkle blue sofa. The cot, however, wears a darker shade of blue. 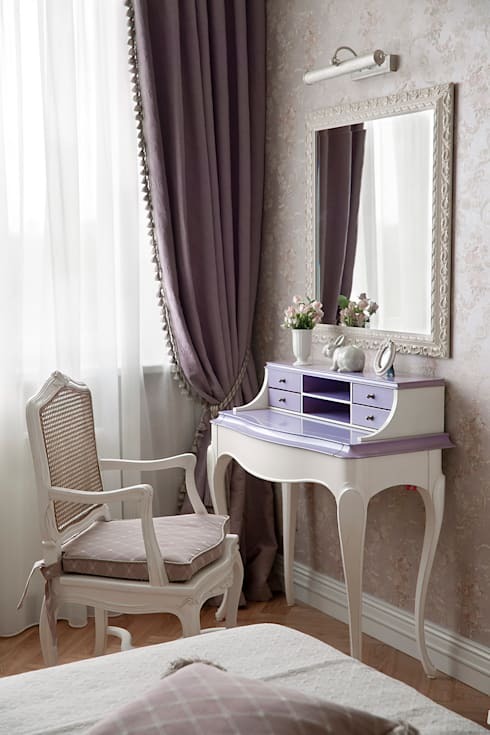 Same meticulous attention to detail is observed in the arrangement of a duo tone vanity. It is decorated with potted plants, a small piece of sculpture and an antique illustration hanging from the wall. 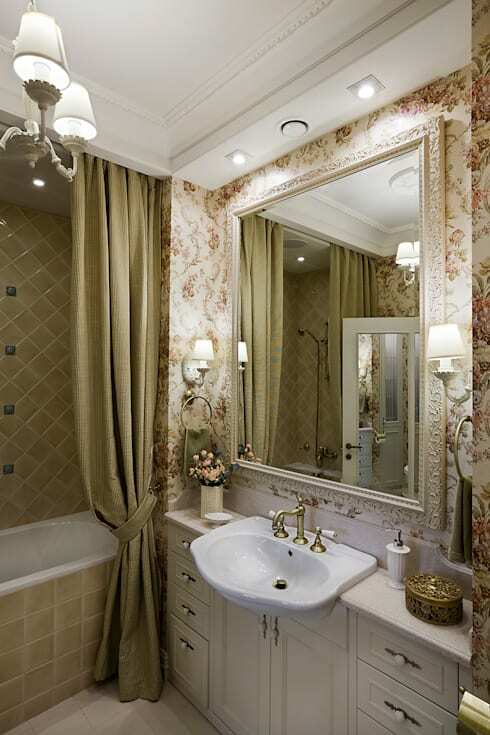 The bathroom is decorated with all the splendours of a neoclassical home. Fine bathroom fittings find appropriate company in majestic lighting fixtures, florid wallpaper, vanity units and beautifully framed mirror. Flowers and curtains not only accessorise but also help creating a soothing atmosphere.